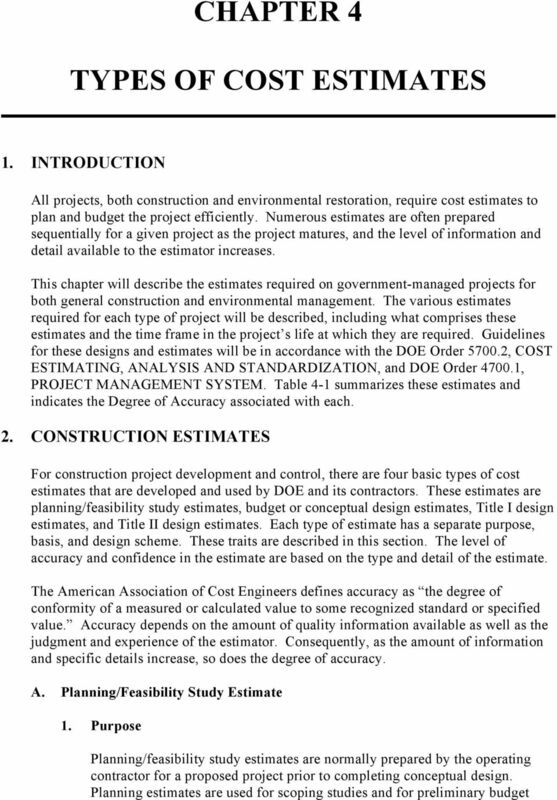 Download "CHAPTER 4 TYPES OF COST ESTIMATES"
2 4-2 DOE G estimates of TPCs and shall be reflected on short form project data sheets for identified projects. 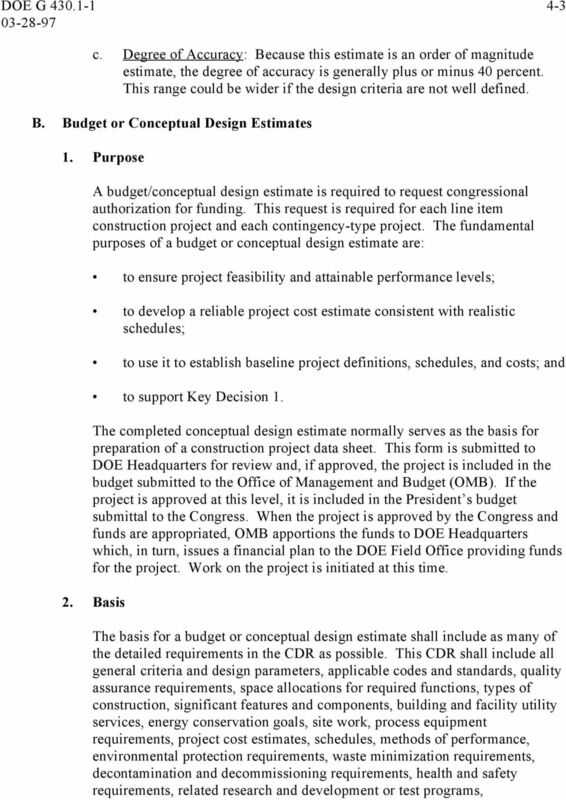 The short form project data sheet includes an estimate of funds required and a schedule for the performance of conceptual design on each project. These short form project data sheets are submitted to the appropriate DOE Headquarters program office for review and advisement on which projects will be supported in the budget requests. Planning/feasibility study estimates should support Key Decision Basis The basis for the planning estimate must describe the purpose of the project, general design criteria, significant features and components, proposed methods of accomplishment, proposed construction schedule, and any known research and development requirements. Any assumptions made by the estimator in this phase shall be documented for review and concurrence. Planning estimates are based on past cost experience with similar type facilities, where available, and order of magnitude estimates in the absence of previous cost experience. Engineering costs in this type of estimate generally are based on a percentage of estimated construction costs, and consideration will be given to the complexity of the project in establishing the percentage to be used. Similarly, an allowance for contingency will be included in the total project estimate using a percentage of total engineering and construction costs established on the basis of complexity and uncertainties of the component parts of the project. 3. Design Scheme a. 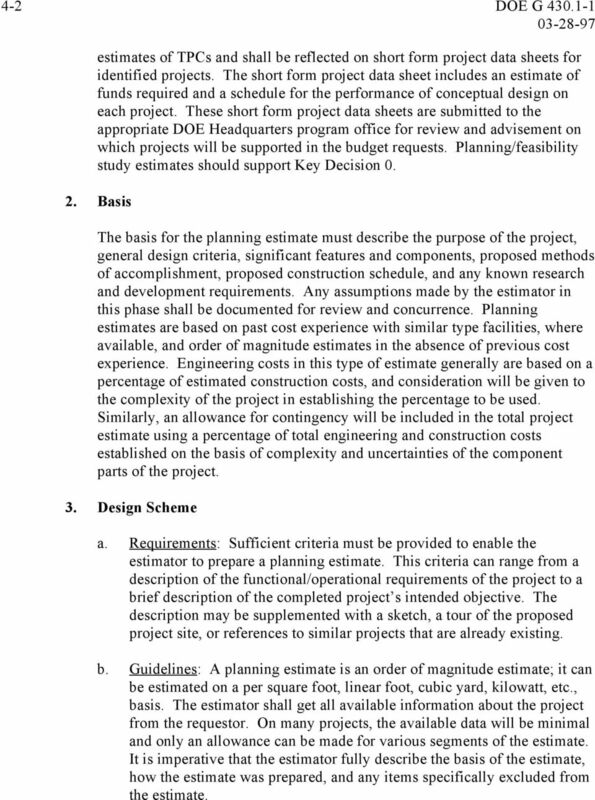 Requirements: Sufficient criteria must be provided to enable the estimator to prepare a planning estimate. This criteria can range from a description of the functional/operational requirements of the project to a brief description of the completed project s intended objective. The description may be supplemented with a sketch, a tour of the proposed project site, or references to similar projects that are already existing. b. Guidelines: A planning estimate is an order of magnitude estimate; it can be estimated on a per square foot, linear foot, cubic yard, kilowatt, etc., basis. The estimator shall get all available information about the project from the requestor. On many projects, the available data will be minimal and only an allowance can be made for various segments of the estimate. It is imperative that the estimator fully describe the basis of the estimate, how the estimate was prepared, and any items specifically excluded from the estimate. 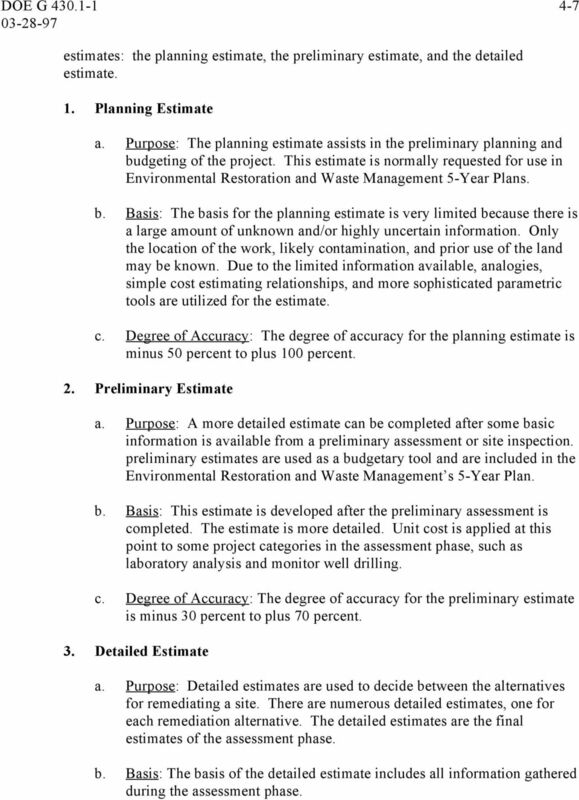 7 DOE G estimates: the planning estimate, the preliminary estimate, and the detailed estimate. 1. Planning Estimate a. Purpose: The planning estimate assists in the preliminary planning and budgeting of the project. This estimate is normally requested for use in Environmental Restoration and Waste Management 5-Year Plans. b. Basis: The basis for the planning estimate is very limited because there is a large amount of unknown and/or highly uncertain information. Only the location of the work, likely contamination, and prior use of the land may be known. Due to the limited information available, analogies, simple cost estimating relationships, and more sophisticated parametric tools are utilized for the estimate. c. Degree of Accuracy: The degree of accuracy for the planning estimate is minus 50 percent to plus 100 percent. 2. Preliminary Estimate a. Purpose: A more detailed estimate can be completed after some basic information is available from a preliminary assessment or site inspection. preliminary estimates are used as a budgetary tool and are included in the Environmental Restoration and Waste Management s 5-Year Plan. b. Basis: This estimate is developed after the preliminary assessment is completed. The estimate is more detailed. Unit cost is applied at this point to some project categories in the assessment phase, such as laboratory analysis and monitor well drilling. c. Degree of Accuracy: The degree of accuracy for the preliminary estimate is minus 30 percent to plus 70 percent. 3. Detailed Estimate a. Purpose: Detailed estimates are used to decide between the alternatives for remediating a site. There are numerous detailed estimates, one for each remediation alternative. The detailed estimates are the final estimates of the assessment phase. b. Basis: The basis of the detailed estimate includes all information gathered during the assessment phase. 8 4-8 DOE G c. Degree of Accuracy: The degree of accuracy for the detailed estimate is plus or minus 25 percent. B. Cleanup Phase After the remediation alternative is selected, estimates are required during the cleanup phase of the project. There are four basic cleanup estimates: planning estimates, feasibility estimates, preliminary estimates, and detailed estimates. 1. Planning Estimate a. Purpose: The planning estimate is required for budgetary purposes or for inclusion in planning documents. 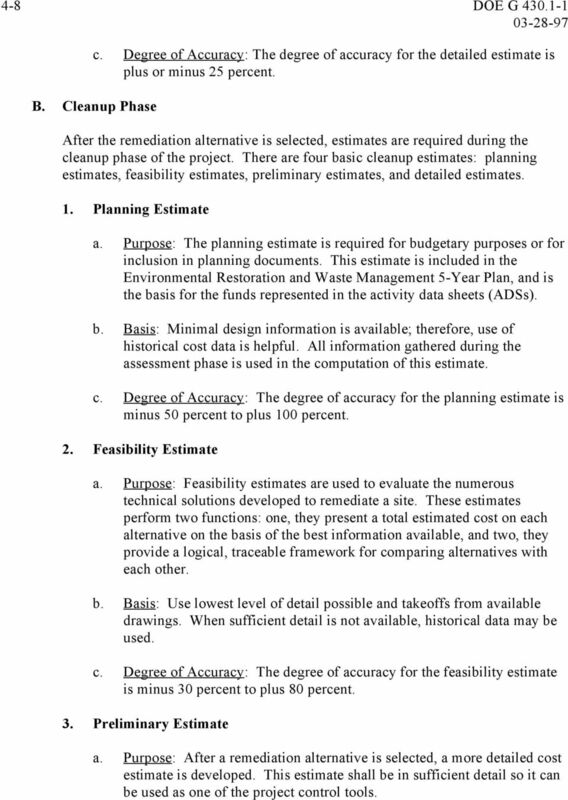 This estimate is included in the Environmental Restoration and Waste Management 5-Year Plan, and is the basis for the funds represented in the activity data sheets (ADSs). b. Basis: Minimal design information is available; therefore, use of historical cost data is helpful. All information gathered during the assessment phase is used in the computation of this estimate. 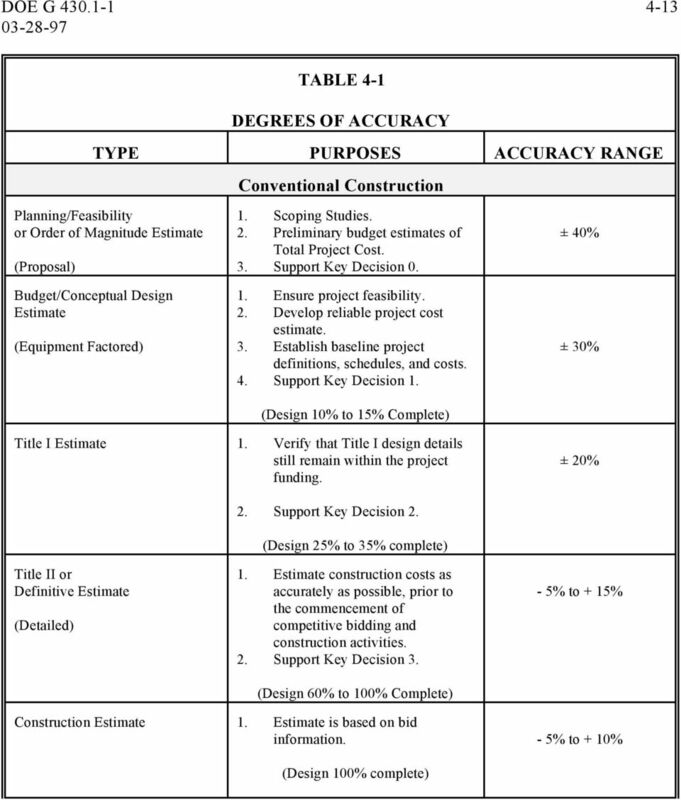 c. Degree of Accuracy: The degree of accuracy for the planning estimate is minus 50 percent to plus 100 percent. 2. Feasibility Estimate a. Purpose: Feasibility estimates are used to evaluate the numerous technical solutions developed to remediate a site. These estimates perform two functions: one, they present a total estimated cost on each alternative on the basis of the best information available, and two, they provide a logical, traceable framework for comparing alternatives with each other. b. Basis: Use lowest level of detail possible and takeoffs from available drawings. When sufficient detail is not available, historical data may be used. c. Degree of Accuracy: The degree of accuracy for the feasibility estimate is minus 30 percent to plus 80 percent. 3. Preliminary Estimate a. 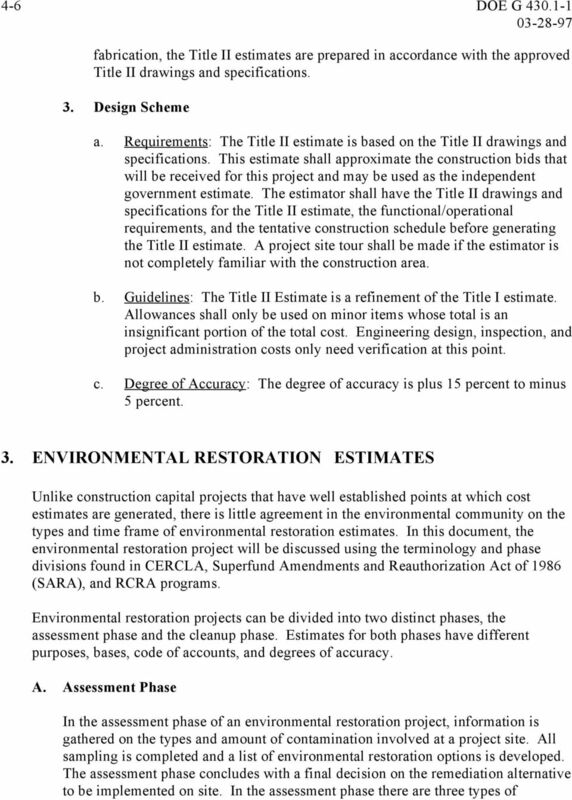 Purpose: After a remediation alternative is selected, a more detailed cost estimate is developed. This estimate shall be in sufficient detail so it can be used as one of the project control tools. 10 4-10 DOE G when the estimate is within the limits established by the government s approval of the cost-type contractors procurement system. 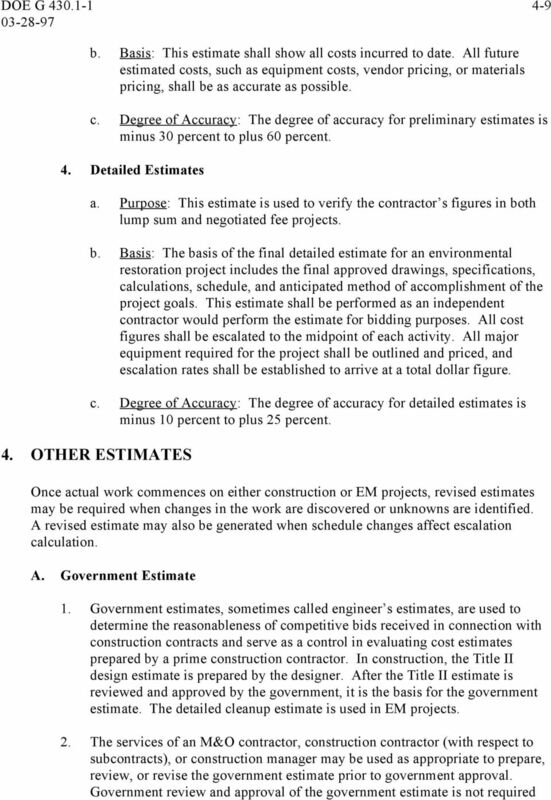 The specifics of a government estimate vary with the size and type of contracts as delineated below. a. Architect-Engineer and Construction Contracts Government estimates shall be prepared for all construction and architectengineer contracts, except for contracts less than $25,000. Such estimates may be revised when inaccuracies or inconsistencies are revealed during negotiations. b. Fixed-Price Construction Contracts 1. Government estimates for fixed-price construction contracts and modifications thereto shall be based on approved Title II working drawings and specifications. These estimates shall be prepared in accordance with the practices of the construction industry and in the same careful manner as if the government were bidding in competition with private contractors. 2. 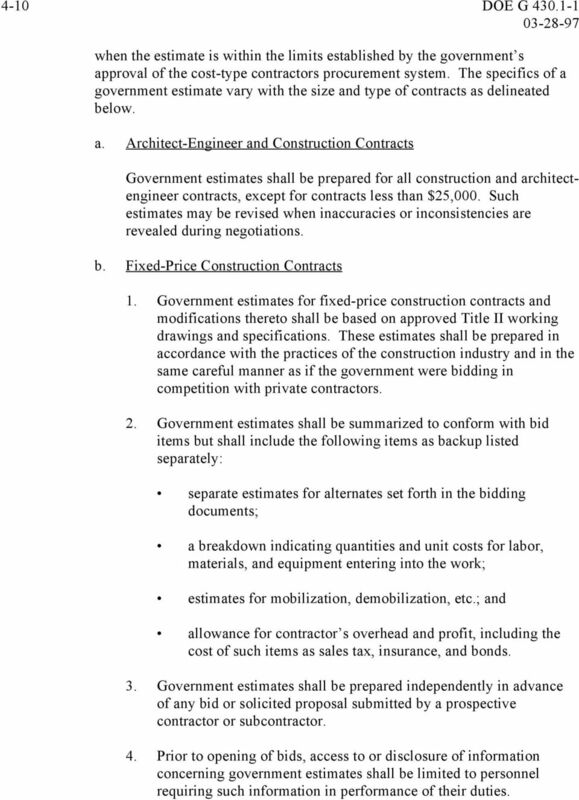 Government estimates shall be summarized to conform with bid items but shall include the following items as backup listed separately: separate estimates for alternates set forth in the bidding documents; a breakdown indicating quantities and unit costs for labor, materials, and equipment entering into the work; estimates for mobilization, demobilization, etc. ; and allowance for contractor s overhead and profit, including the cost of such items as sales tax, insurance, and bonds. 3. Government estimates shall be prepared independently in advance of any bid or solicited proposal submitted by a prospective contractor or subcontractor. 4. Prior to opening of bids, access to or disclosure of information concerning government estimates shall be limited to personnel requiring such information in performance of their duties. 11 DOE G Government estimates for formally advertised or competitive proposal fixed-price construction contracts shall not be changed after the opening of bids or proposals except where careful reexamination indicates a definite typing or arithmetic error. In the event an estimate is changed under such circumstances, detailed reasons for the revision shall be documented. B. 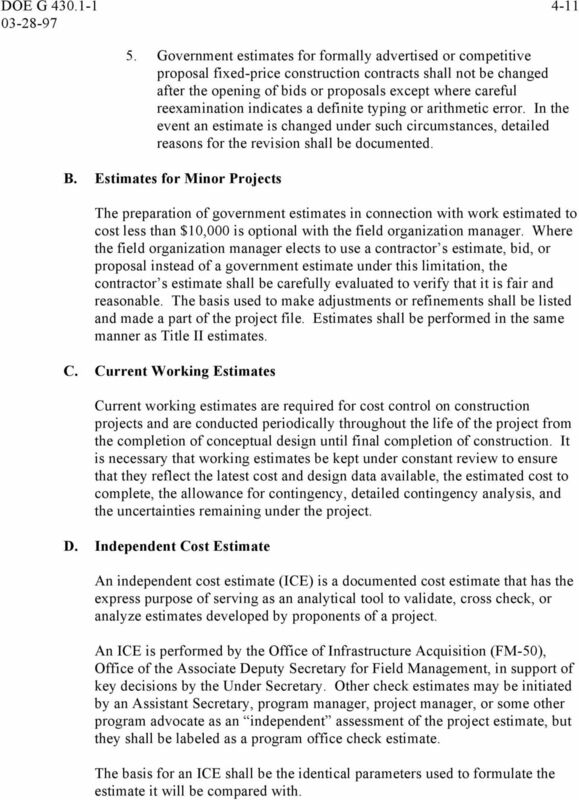 Estimates for Minor Projects The preparation of government estimates in connection with work estimated to cost less than $10,000 is optional with the field organization manager. Where the field organization manager elects to use a contractor s estimate, bid, or proposal instead of a government estimate under this limitation, the contractor s estimate shall be carefully evaluated to verify that it is fair and reasonable. The basis used to make adjustments or refinements shall be listed and made a part of the project file. 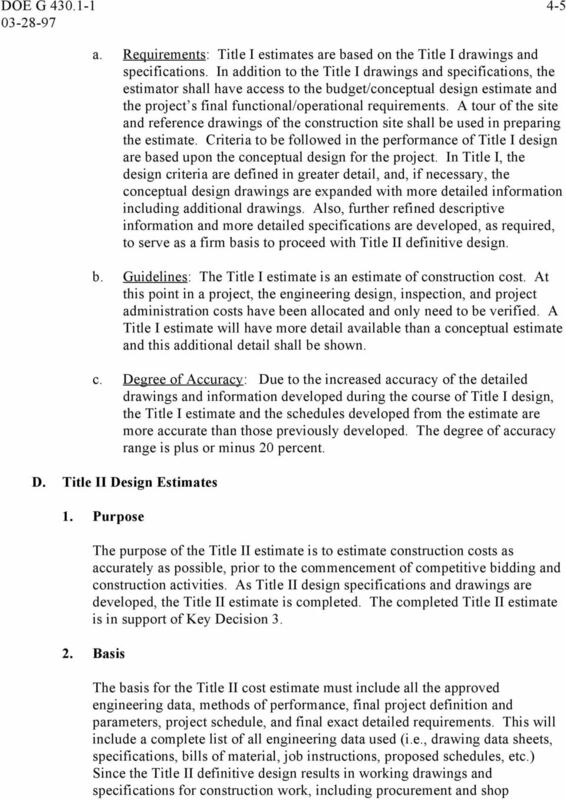 Estimates shall be performed in the same manner as Title II estimates. C. Current Working Estimates Current working estimates are required for cost control on construction projects and are conducted periodically throughout the life of the project from the completion of conceptual design until final completion of construction. It is necessary that working estimates be kept under constant review to ensure that they reflect the latest cost and design data available, the estimated cost to complete, the allowance for contingency, detailed contingency analysis, and the uncertainties remaining under the project. D. Independent Cost Estimate An independent cost estimate (ICE) is a documented cost estimate that has the express purpose of serving as an analytical tool to validate, cross check, or analyze estimates developed by proponents of a project. An ICE is performed by the Office of Infrastructure Acquisition (FM-50), Office of the Associate Deputy Secretary for Field Management, in support of key decisions by the Under Secretary. Other check estimates may be initiated by an Assistant Secretary, program manager, project manager, or some other program advocate as an independent assessment of the project estimate, but they shall be labeled as a program office check estimate. The basis for an ICE shall be the identical parameters used to formulate the estimate it will be compared with. 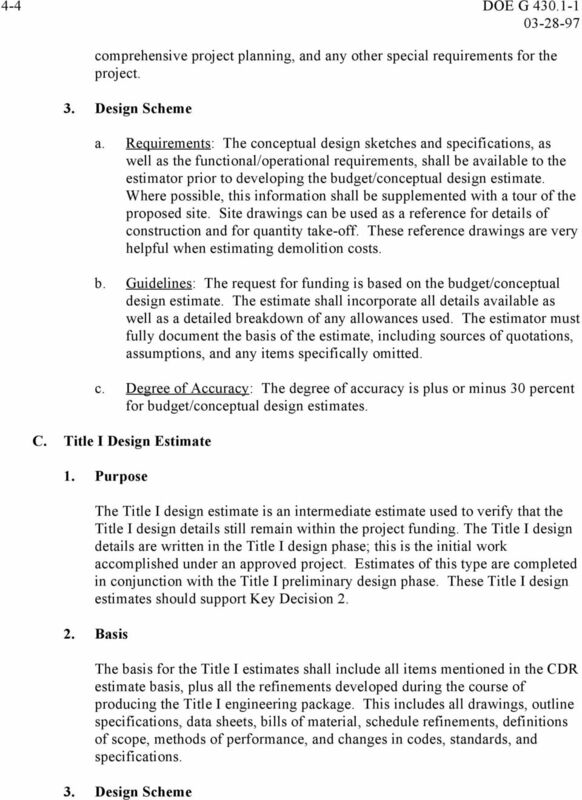 12 4-12 DOE G The basis for these cost estimates must carefully define the purpose and scope of the estimate, along with a complete list of all the considerations used to develop the estimate for costs experienced to date and data used to complete the projections. E. Bilateral (Two-Party) Estimate This estimate is prepared concurrently by two parties who have mutual responsibility or interest in the total cost. For example, when a site changes operations from production to decontamination and decommissioning (D&D), a budget estimate for the shutdown and D&D must be completed. When this transfer of operations involves two programs or agencies, both interested parties will work together to develop the estimate. An FM-50 ICE could also be performed on this type of estimate. F. Performance versus Forecast Performance versus forecast estimates are usually produced for long-term projects (i.e., a project life of 5 or more years). These estimates can be completed for the whole project or a portion of a project. 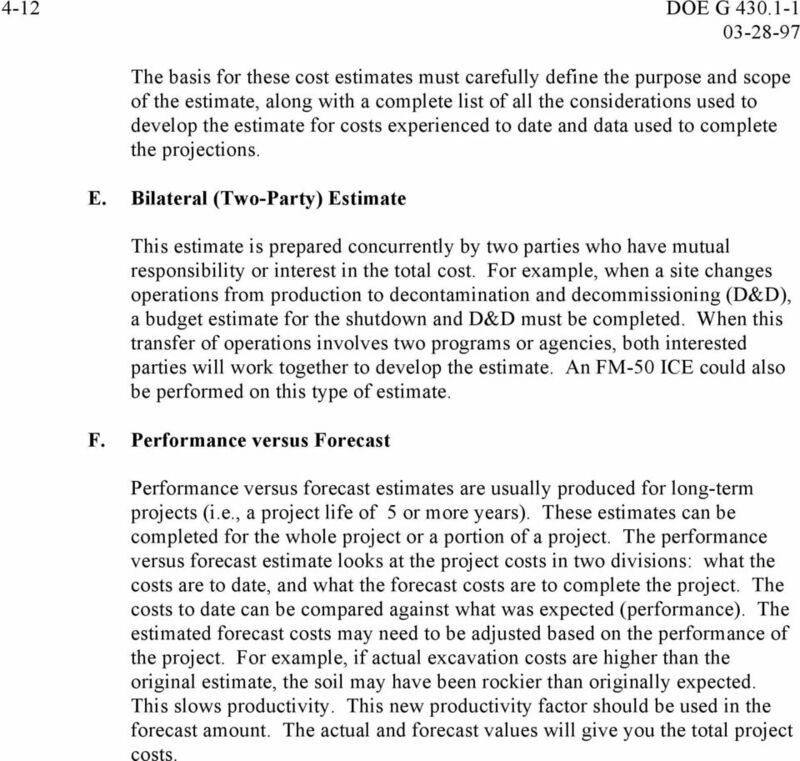 The performance versus forecast estimate looks at the project costs in two divisions: what the costs are to date, and what the forecast costs are to complete the project. The costs to date can be compared against what was expected (performance). The estimated forecast costs may need to be adjusted based on the performance of the project. For example, if actual excavation costs are higher than the original estimate, the soil may have been rockier than originally expected. This slows productivity. This new productivity factor should be used in the forecast amount. The actual and forecast values will give you the total project costs. 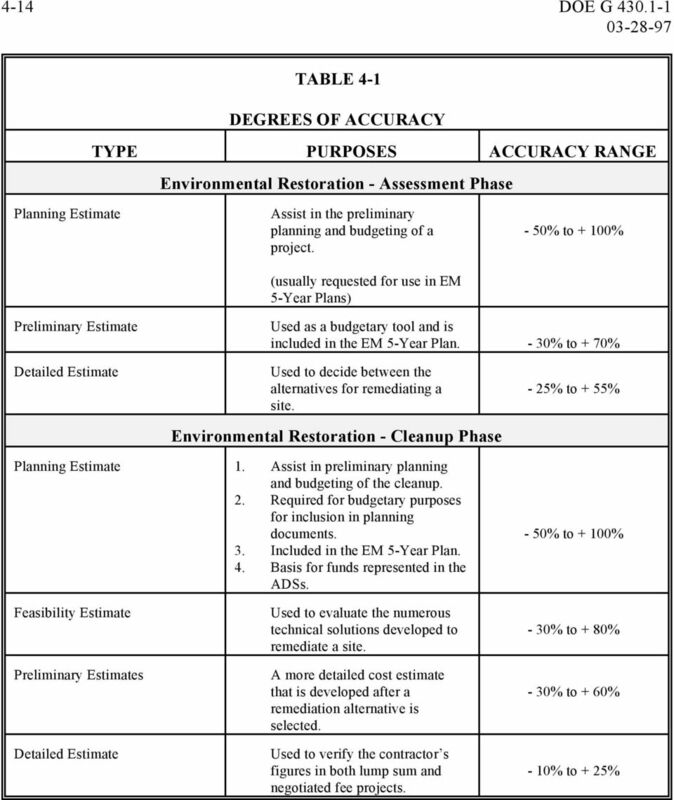 14 4-14 DOE G TABLE 4-1 DEGREES OF ACCURACY TYPE PURPOSES ACCURACY RANGE Environmental Restoration - Assessment Phase Planning Estimate Assist in the preliminary planning and budgeting of a - 50% to + 100% project. (usually requested for use in EM 5-Year Plans) Preliminary Estimate Detailed Estimate Used as a budgetary tool and is included in the EM 5-Year Plan. - 30% to + 70% Used to decide between the alternatives for remediating a - 25% to + 55% site. Environmental Restoration - Cleanup Phase Planning Estimate 1. Assist in preliminary planning and budgeting of the cleanup. 2. Required for budgetary purposes for inclusion in planning documents. - 50% to + 100% 3. Included in the EM 5-Year Plan. 4. Basis for funds represented in the ADSs. Feasibility Estimate Preliminary Estimates Detailed Estimate Used to evaluate the numerous technical solutions developed to - 30% to + 80% remediate a site. A more detailed cost estimate that is developed after a - 30% to + 60% remediation alternative is selected. Used to verify the contractor s figures in both lump sum and - 10% to + 25% negotiated fee projects. STATUTORY BOARD FINANCIAL REPORTING STANDARD SB-FRS 11 Construction Contracts This version of SB-FRS 11 does not include amendments that are effective for annual periods beginning after 1 January 2015. Government Contracting 101 PART 2. Text File. Welcome to SBA s training program, Government Contracting 101, Part 2. The contractor produces several missile weapon systems used by the Navy, Air Force and Marine Corps. International Accounting Standard 11 Construction Contracts Objective The objective of this Standard is to prescribe the accounting treatment of revenue and costs associated with construction contracts. UNIT CERTIFICATION Statement of Completion has satisfactorily completed training in the duty of this Unit under the conditions described below and in accordance with the overall standard(s) for this Unit. Final Report Bid Evaluation and Selection Process For Wind-Generated Electricity Hydro-Quebec Distribution Call For Tenders Process.